Posted on March 15, 2019 at 9:43 am. Seven Arlington Public Schools teams will be representing the NOVA East Odyssey of the Mind Region 11 at the Virginia Odyssey of the Mind State Finals Tournament on Sat, April 6 at Manassas Park High School. 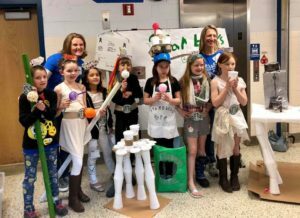 Odyssey of the Mind is an international educational program that provides creative problem-solving opportunities for students from kindergarten through college. Team members apply their creativity to solve problems that range from building robots and cars, to creating elaborate theatrical performances and reinterpreting classic works of art. They learn team building and strengthen their creative thinking skills along the way. Glebe Elementary School has 21 students — all third and fifth grade girls — going to the state championship. Glebe #1 – Glebe fifth grade girls, Division I age group, won in “Problem #2,” which combines technical engineering requirements with creative presentation. Glebe #2 – Glebe fifth grade girls, Division I age group, won in “Problem #3,” which requires the reinterpretation of a classic creation, this year the works of Leonardo da Vinci. Glebe #3 – Glebe third grade girls, Division I age group, won in “Problem #5,” which asks the students to create a humorous and stylish theatrical presentation. Long Branch Elementary School won in the Division I “Problem #1” vehicle challenge, in which they had to engineer a car that could be disassembled, packed in a suitcase, then reassembled and used to complete tasks with a student riding on it! In Division II, there are two Swanson Middle School teams going to the state championship round. One group of Swanson students won the Division II “Problem #1” vehicle challenge. Another group of Swanson students won the “Problem #5” Division II competition with their theatrical presentation. A Williamsburg Middle School team won the Division II “Problem #4” balsa wood structure building challenge. Their structure held 292 pounds of weight before it cracked. To view more results, click here.